Gasket between AIR pipe and exhaust manifold 12553617.
, all other persons associated in the making, production, participation, and sale of this publication. Rephrased in plain English: When you purchase this CD, book, or view this web page you, your next of kin, heirs or assigns agree not to sue any associated persons with the publication for any accident or damage in ANY form (mental or physical to your car and/or yourself) because of this publication or your failure to heed proper safety, maintenance and/or modification procedures. You also agree that your next of kin, heirs or assigns cannot sue all persons associated in the making, production, participation, and sale of this publication. 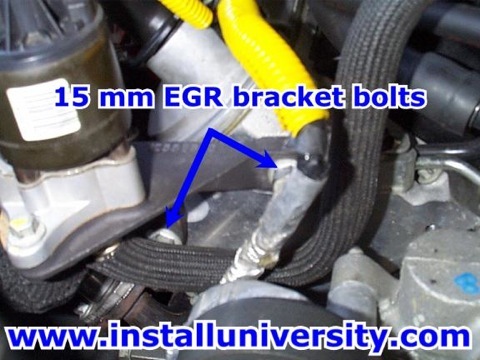 The EGR pipe protrudes down behind the throttle body restricting airflow. Cutting down the part of the pipe that protrudes down behind the throttle body will provide better flow into the intake manifold. This modification will probably provide 3 rear wheel horsepower at best. Every bit helps and that is way this modification is still being done. Still wondering what in the world we are talking about? Click here to visit the bottom of this page to see a before and after view. 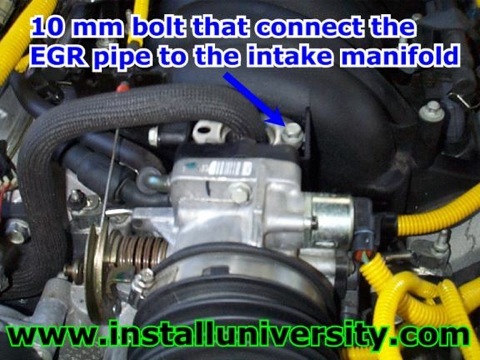 You will notice on some install pages they do not recommend removing the entire EGR pipe to perform this modification. The pages suggest you just undo the one 10 mm screw holding the EGR pipe to the intake manifold and bending the pipe back a little bit. We DO NOT agree with that at all. We bent our pipe back for curiosity purposes and started a big problem with the rubber o-ring on the pipe. Because we did not get the bend back to the original form, half of the o-ring would sag down into the manifold and cause a major vacuum leak. This will cause your car to idle very SPORADICALLY and you can notice the leak by the LOUD whistling sound coming from under the hood. We suggest taking an extra 10 minutes and removing the pipe all together. After all, you will be able to make a better cut and decrease your chances on cutting something else in the engine compartment. We also recommend you buy a replacement o-ring gasket to replace the one on the pipe when you take it out. The heat over time weakens the gasket and makes it real easy to sag down and cause a vacuum leak. You also should have a replacement gasket for the EGR pipe to exhaust manifold connection. It is a metal gasket that is really easy to flake apart. This will cause a loud ticking sound if it does not seal back properly.
. This is a critical step and must be read before you make the same mistake we did! Watch out for that gasket, it is very fragile and might split into pieces if you are not careful. We got a new gasket to replace the old one because we also messed it up when we bent the pipe. The replacement gasket part number is 12553617. 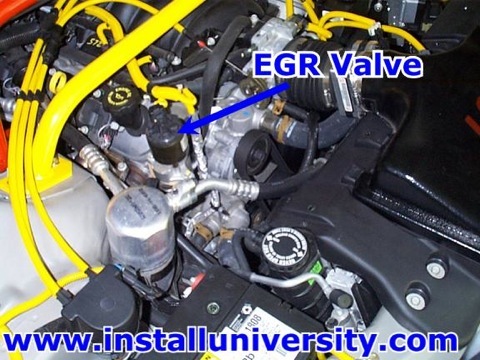 Remove the EGR pipe by twisting the EGR pipe around to get it out from the wire that runs in front of the EGR valve. Just take your time and you will get it out from under it.
. The 1.25 inch measurement is as good of a place as any. 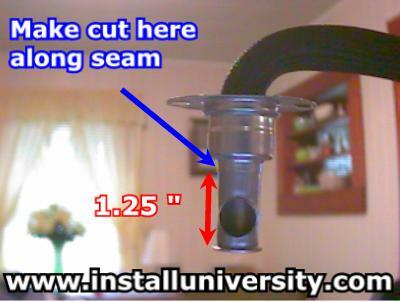 It just so happens that there is a seam in the pipe right at measurement and that is how we chose the spot to cut. Notice we do not have a rubber gasket on the pipe. We took it off before cutting the pipe. to see a picture of the EGR pipe after the cut has been made. Be sure to grind down the cut edge so that the cut looks like it was from the factory. 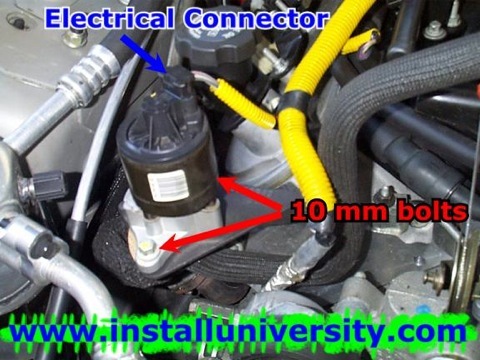 This ensures that you don't leave any metal particles to get sucked down and thrown into your engine's cylinders. 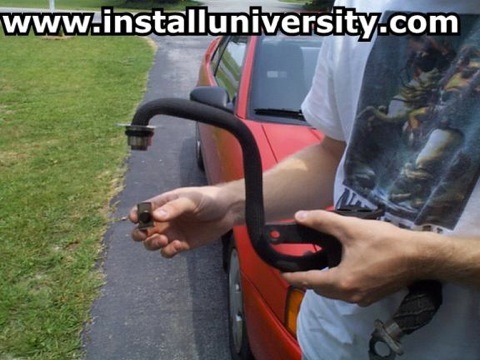 Be sure to replace the o-ring gasket back onto the pipe. We used a brand new o-ring to be safe.
. Don't forget to place the gasket back in there. This next step is very critical! Please pay close attention! when tightening the EGR pipe back up to the intake manifold. Tighten the 10 mm bolt that attaches the EGR pipe to the intake manifold to 89 in-lb. Please do not exceed that measurement! You might want to use a 3 inch extension to rise above the EGR pipe if you torque wrench is to fat.
. Yes twice. Tighten them to 89 in-lb the first go around. 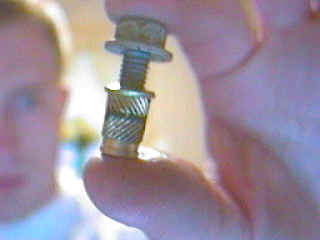 Then tighten the bolts on up to 18 ft-lb.
. Notice on the "before" picture you can clearly see the EGR pipe extend down. The "after" picture you can not see the pipe at all. 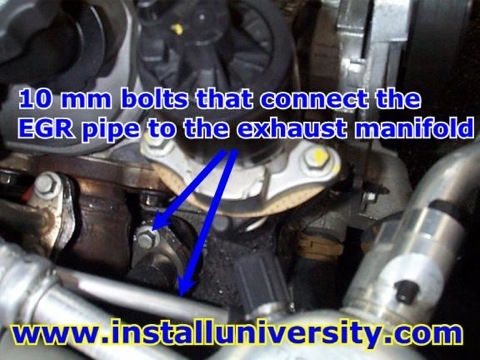 You are just cutting the pipe so the air can have a less restrictive path into the intake manifold. When you are strapped for cash free modifications look better and better. 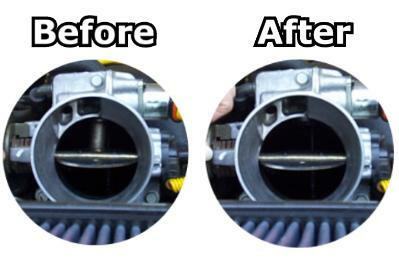 Do not be surprised if you see a slight increase in engine temperature (only a few degree's and should only be noticeable using a scan tools such as Auto Tap) because the re-circulated gases (which help cool the cylinders) will have more trouble entering the system as they were intended.